Pair this light up with a white dress or colorful outfit to create a fun and whimsical unicorn costume for Halloween or a mythical costume theme masquerade party. 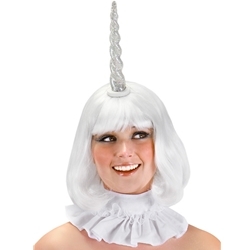 The light-up unicorn horn is clear and lights up in a rainbow of colors using LED lights. Attaches to the head using adjustable strap. Batteries included.